Whoa - hold on for Baker Lake. 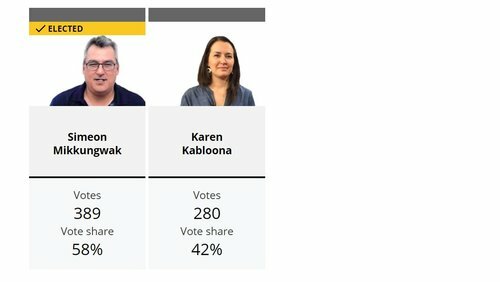 Elections Nunavut's results have just flipped. Now it's saying Simeon Mikkungwak has retained his seat. Simeon Mikkungwak has indeed been re-elected in Baker Lake. We've also got final results in for the seven-way race in Ammituq. Hall Beach's Joelie Kaernerk has won a close race, with incumbent George Qulaut finishing third. 5 official races called tonight. 3 incumbents retained, 2 new MLAs so far (3 if you include Mila Kimingoak, who was acclaimed). And the winner in Baker Lake is...La La Land? Jane they are indeed fast and furious - maybe a bit too fast! Another incumbent has held on to his seat (and our first cabinet minister of the night), as Joe Savikataaq has been re-elected in Arviat South. 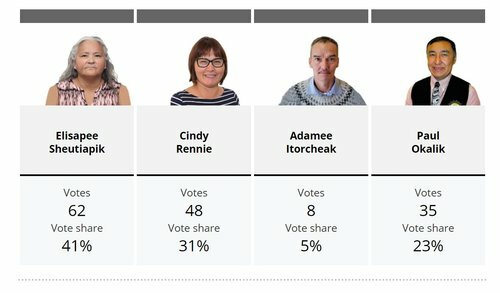 Another cabinet minister, George Hickes, has opened up a huge lead in Iqaluit-Tasiluk, with just one poll left to report. OK, good! I want more results (just like everyone, I think!) Pouring another cup of coffee. 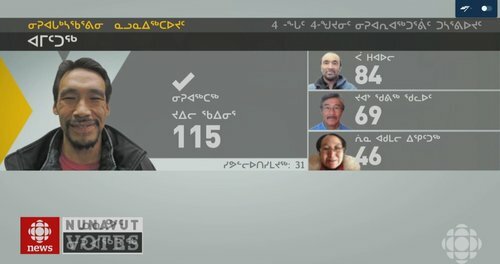 CBC is now calling the Iqaluit-Tasiluk race for George Hickes. That makes cabinet ministers 2-2 so far in called races, though we're hearing Monica Ell may be in trouble. Joe Enook has retained in Tununiq, as well. Look #nuvotes the longer you hold out Pang and Iqaluit votes, the more my kids suffer tomorrow due to my tired/useless parenting. Margaret Nakashuk is opening up a big lead in Pangnirtung. Cabinet Minister Johnny Mike is running a distant third at this point and looking very vulnerable to lose his seat. Missing Maatalii’s expedient results post this election. Seems like such a long wait. Come back to #Nuvotes Maatalii! Pretty quiet on the results front for a little while now. For everyone here - you all are troopers for sticking in there! Starting to see the Iqaluit races taking shape. 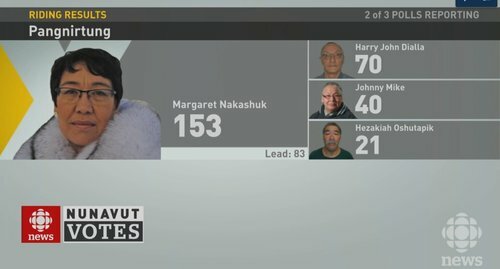 Pat Agnakak has been confirmed as the winner in Iqaluit-Niaqunnguu. Yikes. Little scare with the internet there in the station. But we're back up. Congratulations Elisapee! :) I'm looking forward to see what kind of leadership she provides on addressing social issues, and I think she has a good grasp on municipal issues, which will be interesting to watch. First results now in in South Baffin - and with 2/5 polls, it's a dead heat between Mike Salomonie and incumbent David Joanasie. And we are now confirmed in Iqaluit Sinaa. Elisapee Sheutiapik has won the seat, with incumbent Paul Okalik finishing second. We can now confirm Netsilik as well. Emiliano Qirngnuq has, indeed, been re-elected. Taking a break from here to file for tomorrow morning. I'll check in though! And Margaret Nakashuk has won in Pangnirtung. That makes Johnny Mike the first cabinet minister to lose his seat tonight. Congratulations Pat!! She campaigned hard on addressing Elder issues, and I hope she manages to pull that together! 13 of 22 seats are now confirmed. Among those 13, we've got 5 new MLAs, and 8 retaining their seats.